Doug has a wonderful post entitled Just another shill for educational companies? that I encourage everyone to read. Here’s my policy: all ideas in any of my posts, from these Minor Musings to other, more detailed commentary, are mine – possibly inspired by others but not paid for or encouraged by a company. One of these days I’ll go back and do a round-up of what’s worked and what hasn’t (and what sounded good at the time but now… not so much). The results will probably surprise me, possibly surprise you. But they won’t be “paid for”, I promise. Not quite about books, but reading academic work – this Academic Phrasebook is a great thing to share with students and teachers. And then ask, are [they] ready for college? David’s flow chart for research idea needs to be shared with my teachers before we start seriously thinking about Research Season planning. In my never-ending quest to find a great system to share links and projects with my staff, I’ll be exploring Dropmark (inspiration) and Asana (inspiration). Stay tuned. Some of you may also think about the Everything Notebook. As we start to think about building a new space and how to work with the space we have, it’s always timely to remember the Five Laws of Librarianship and working with our faculty and administration to understand what our mission is. Summer is a great time to binge watch while digitally organizing/reorganizing/decluttering, isn’t it? So here’s what I’ve bookmarked and saved over the past few months. B&N’s Teen Readers blog has a great list of their favorite summer reads and NYPL has a list of great YA reads (runs to make sure we have them on our shelves). Meanwhile, Ernie thinks about the white canon our students are asked to read in school. From NYPL: a great reading challenge. While I can’t comment on my current reading for the Alex Awards, I can say I’m meeting this challenge! You? We’ve been weeding the collection and getting great print and digital replacements. Here are more thoughts on the process from another weeder. 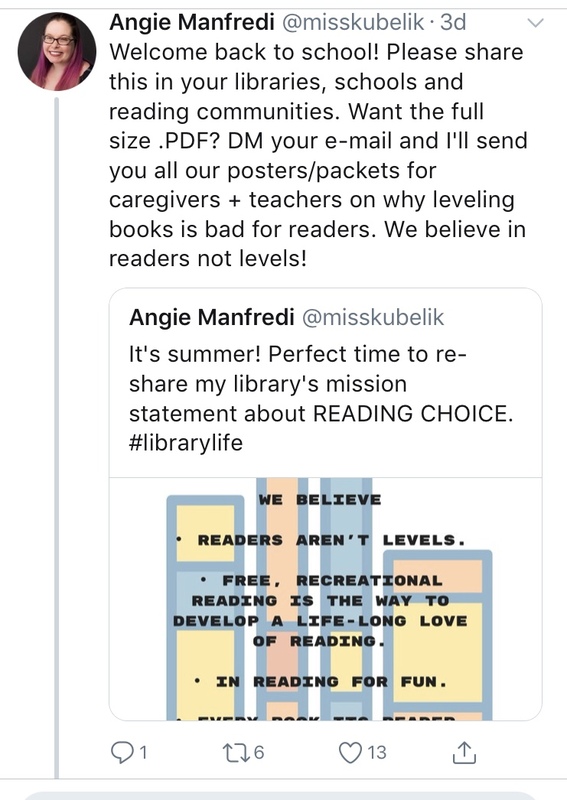 Thinking this summer about The Power of Nonneutral Librarianship and my library’s role in our school’s life. Asking students to interact with Wikipedia may lead to greater understanding of how it works. Here’s one assignment I’d love to try. What skills do students need in the 21st century? IMVHO, they’ve always needed most of these skills, it’s just the tools and pedagogy that changed. I’ve been a huge RSS user for years and, since the demise of Google Reader, I’ve been using Feedbin (try it!). Here’s how to find/create an RSS feed for any site. The more I think about privacy, the more I know that you have to unsubscribe carefully. Here’s one way to protect yourself. And perhaps think about online shopping and privacy. The 23Things movement hasn’t slowed. Might be something to update and try again. Use Twitter? Try TwitLamp to see your timeline. I’ve been doing a mixture of a bullet journal/general notebook for the past few years, starting a new book every July 1. This post on To Do Lists is making me think about how I’m doing this, both digitally and in print. Apropos of the above, the idea of blocking off an entire Friday afternoon to plan makes me miss my days back in the corporate world. Serving on book award committees and keeping an eye on various best selling lists, I’ve always wondered. Now I know what makes a best seller. If you like Litographs, you’ll love these star charts! The artwork of these manuscripts is stunning. Thanks BL for sharing. What happens when you read a book? What about creating something similar for your school or community using local archives and oral histories? Creative Commons now has an image search! Love the “sounds of learning” in your library? This is food for thought (and a plea for quiet spaces). A new way to look at 21st century pedagogy. For the visual learners among us: a guide to statistics. It’s research season for many of us. The OUP has some thoughts about using quotations. And LJ lists great “ready reference” websites and apps we should all use. If you’re a fan of Chrome and use Amazon, check out this extension, which shows whether the book you’re about to pay money for is available for free in your local library! Note to Self’s Privacy Paradox challenge (and tip sheet). And according to this quiz, I’m a minimalist in terms of social media. Do you need to unplug? FeedFlip from MIT – get out of your Twitter bubble. Librarian tested & approved apps. Flippity looks like fun, too. In honor of our mid-March storm, an interactive guide to Boston’s museums (for those don’t leave home “field” trips). Or maybe take this Southern Literary Trip, do a virtual museum tour, go around the world in 80 models, take a tour of where penicillin was discovered or plan to visit some secret libraries. Best: Honey, I Shrunk Myself (into a prayer bead). These miniatures make me happy. I’ve been busy planning for ALAMW and the YMAs – while I usually avoid the crowds, this year I need to be there as part of my Alex Award committee work. So here’s a little something to think about and explore while I finish the 2017 award work (feel free to get ready for the Big Reveal!). Tracking Reader Habits? Luckily, the majority of mine is print and untrackable. Wondering what good books you missed in 2016? The WSJ has a list of the 20 that made their year. While 2016 seemed to have a higher than normal number of celebrity deaths, did you know about these literary losses? Fiction vs. Nonfiction: does the difference matter? Is there a difference? Valentine’s Day is coming – this interactive map of fictional romances in New York City is the perfect to share with students. Then have them update with local information! From detecting “fake news” (can we stop using that phrase?) to choosing courses, we can all use these Tips to Improve Critical Thinking. Or what about a course in The Fine Art of Sniffing Out Crappy Science? It’s never too early to have students think about internet privacy and to reconsider how they’re using the web. And in filter bubble news, make sure everyone knows how Facebook Warps Our World. Schools have replacement cycles for tech, but upgrades just aren’t great anymore. Maybe time to rethink? And what about users skill levels?